I dig it. Cheap and easy. AND colorful. 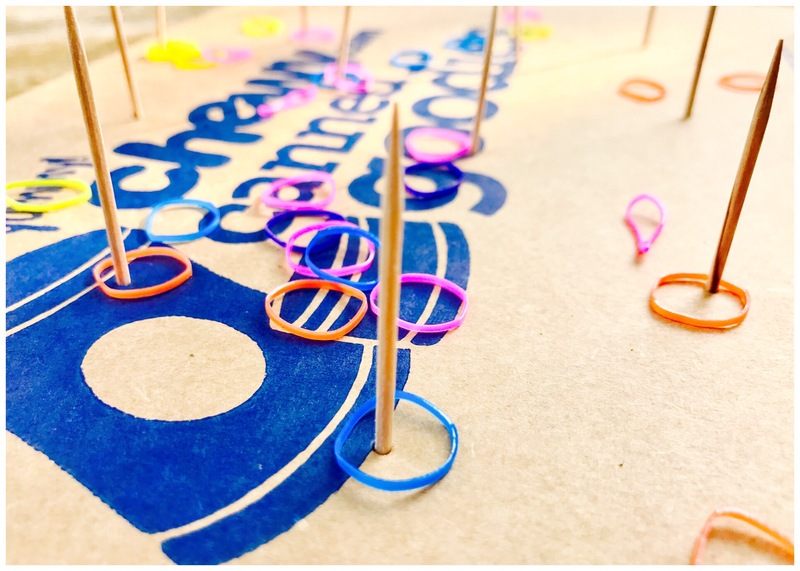 I was chatting with a good friend of mine this week and asked her what she thought of a rubber band ring toss game for my next blog post (I had Minnesota State Fair on the brain). “I dig it. Cheap and easy. And colorful.” Her reply was exactly what we strive for when it comes to birthday party ideas. Since she’s pretty awesome and reliable, I figured I would share this one with all of you! Not only is this activity cheap and easy, it is a game anyone of any skill level can play. Sometimes games played at birthday parties get too competitive which takes the focus off of making the birthday boy/girl’s day special. We want to make their day as special as possible, a day they’ll look back on and love forever. So let’s do just that! Rubber bands – I found mine at the dollar store. All the colors were sorted already which was very helpful. A cardboard box – shout out to my kitties, Boots and Tubby, for supplying me with a box! Toothpicks – also purchased at the dollar store. DOLLAR STORE I LOVE YOU. Have each guest toss 20 rubber bands one by one onto the board. Once that player is done, count how many bands went around the toothpicks and record their score. Wipe the board clean and play until all guests have gone. Whoever has the highest score at the end is the winner! All guests throw their rubber bands at once in this game. Have guests line up around the board and on the count of three have them throw all of their rubber bands onto the board. Tilt the board to slide all of the rubber bands off in order to count the ones that remain around the toothpicks. Divide up the colors and count to see who rung the most toothpicks! Redistribute rubber bands and play as many times as you’d like! Hip hip hooray! Another successful birthday party in the books that fills your special birthday person with love, happiness, and memories and leaves your mind free of stress and worry. Happy birthday party planning! Previous Post A PoPcOrN Party!